Horror graphic novel turned up-and-coming film, The Chair, didn’t quite reach it’s initial goal of $300,000, but achieved a great deal. Not only did it bring in a large number of backers, it raised a good deal of awareness about the project, leading to the financial backing of private investors. These investors have allowed the film to relaunch with a much smaller goal of $40,000. If you take the previous campaign’s ability to raise over $100,000 into account, this new goal shouldn’t be a problem. If you backed the previous campaign, all of your pledge options are back on the table along with a few new perks. 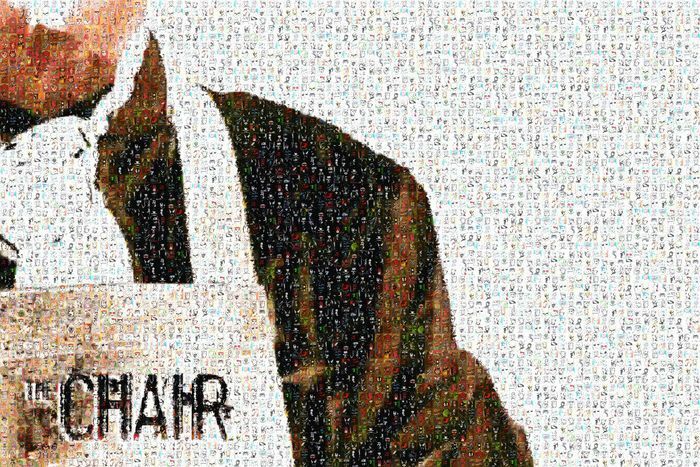 One of those includes an 11×17 photo mosaic poster that will feature pictures from every backer on the Kickstarter, signed by the cast and crew. Like gritty, smart horror? Click on over to the new and improved Kickstarter campaign for The Chair, ending on July 30, 2014! From the campaign page: The Chair follows the story of Richard Sullivan (to be played by Brian Thompson), an innocent man struggling to escape execution on death row. Witnessing the torture and murder of his fellow inmates at the hands of the prison’s sadistic and psychotic Warden (to be played by Bill Oberst Jr.), Sullivan decides that the only way to survive is to fight back. But as he matches the savagery and brutality occurring in the prison, Sullivan is forced to come face to face with his own sanity. Many strong themes are also explored in the film, including domestic violence, child abuse, mental health care, the ethics of torture, the criminal justice system, and capital punishment. A battle of nature vs. nurture, THE CHAIR is a dark and gritty psychological horror film without monsters, zombies, or vampires – a film that shows the capacity for good and evil that exists within all of us.